From time to time, substitute teachers will go to a classroom and find that there is no lesson plan waiting for them. 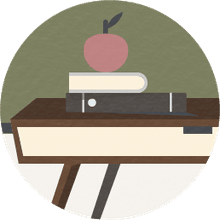 When you as a substitute are familiar with the subject at hand, you can typically use the textbook as a basis for a lesson about the topic currently being taught. However, an issue arises when you know little about the class's subject. It can be even worse when you have no textbook available for review. Therefore, it is best to come prepared for the worst with activities and ideas of things to do with students. Obviously, it is always best to relate any work that you give to the subject if you can, but if not, it is still important to keep students busy. The worst thing to do is to just let them talk, as this can often lead to either disruption within the class or even worse noise levels that disturb neighboring teachers. Following is a list of ideas that you can use to help in this type of situation. Several of these suggestions include games. There are countless skills that students can develop through game playing such as critical thinking skills, creativity, teamwork, and good sportsmanship. There are opportunities for the students to practice speaking and listening skills when games are played individually or in groups. Some of these games or activities require more preparation than others. Obviously, you will need to use your best judgment about which will work with a particular class of students. It is also best to be prepared with a few of these just in case one is not working as well as you think it should. You can also get student input on which they would like to do. Play a Trivia Game - Bring trivial pursuit questions and set the class up into teams. Have them take turns answering questions while keeping score. Draw Picture or Write a Story About a Prop - Bring in a prop and have students either draw a picture of it or write a story or poem about it. Then give out 'awards' for best in the class, most original, funniest, etc. before the end of the class. View Optical Illusions - Print out a number of optical illusions, link to them for a Smartboard, or put them on transparencies and project them on a screen. Have students spend some time trying to work out what they are looking at. This is a high-interest activity that can spur interesting discussions. Share Pictogram (Rebus) Puzzles - These are word puzzles (GOT, GOT, GOT, GOT) that are visual (Answer: FOUR GOT= FORGOT) Print out a number of optical illusions, link to them for a Smartboard, or put them on transparencies and project them on a screen. Play a Game of Hypotheticals - Pose hypothetical questions to students and have them come up with answers and solutions. These are best if they serve a purpose and instruct while still being fun. For example, you might include questions about first aid or dangerous situations to help students think through the best course of action in these situations. Have Students Complete Crossword and/or Word Search Puzzles - Keep a stack of crossword and word search puzzles ready to hand out for students to complete. Play Hangman - This requires little preparation. However, it is best done in small groups; winners could then compete in tournament rounds. Make Origami "cootie catchers"- Use an "origami cootie catcher" as a study guide: Directions on this link. Have students place vocabulary terms on the outside flap and the definition when the inside flap is opened. Play 20 Questions - Tell the students whether you are thinking of a person, place or thing. Give them clues after every five questions. It can also be fun to keep score while you play. You get a point if you stump them and they get a point if they guess the right answer. Scattergories- The object is to quickly fill out a category list with answers that begin with the assigned letter. Points awarded if other players/teams haven't thought of the same answers. The player/team with the most points wins. Game board rules; list generator on this link. Four Winds Blow-(or Great Winds Blow) (also known as the Big Wind Blows) is similar to Musical Chairs. The game allows students the chance to get to know each other a bit better. You’ll need chairs-one fewer than the total number of players. One person starts by saying “Four winds blow for everyone who…” and then says any characteristic that could be true, "...ate breakfast." All players who ate breakfast must quickly find a new seat that is more than two chairs away from them. If the player is not able to find a vacant seat, he or she is the new person who is in the middle. Rules on this link. Play Pictionary - If you have Pictionary cards and have two teams in your class take turns trying to guess what their teammate is drawing on the board. Rules to play without the game cards is at this link. Have Students Write Mission Statements and Goals for Themselves - Teach students all about personal mission statements and goal setting exercises. Then guide them as they create their own.